OhEmGee! There are 10 days ’til Christmas! Can you believe it? I have been running around like a mad woman trying to get my shopping and wrapping and baking in. And getting my house party-ready, on top of working, teaching, and participating. It’s hectic and I’m tired. The last few days I’ve been taking some time to get some of the treats made – I have batches of goodies made for my party this upcoming weekend, for Christmas dinners, for work (I’m now the favorite) and for my boyfriend’s work. I’m being careful not to sample or lick the spoons. And on top of that I made the best salad the other night for our dinner. It was so good that my boyfriend took a big bowlful to work with him the next day as I did today. AND after my incredibly exhausting class tonight I was ecstatic to come home and stuff my face with it again. The original recipe is HERE. I’ve omitted the nuts and seeds and the feta….and I didn’t put any dressing on it. It is still delicious and it’s so pretty. 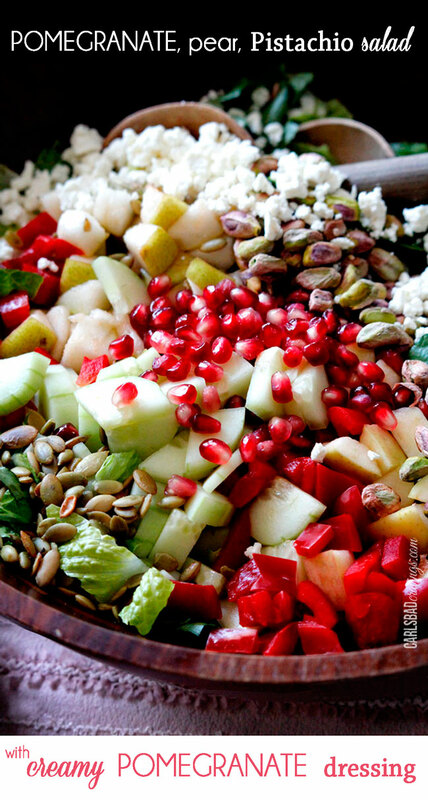 I will definitely be eating this salad often. I just can’t get enough. And the pomegranate just adds that little extra pizzazz. It’s like a sweet little festive decoration. See? It’s still easy to eat healthy during the holidays.